New Delhi, the 27th June, 2017: The Central Board of Direct Taxes hereby makes the following rules further to amend the Income-tax Rules, 1962, now may be called the Income –tax (17th Amendment) Rules, 2017. and they shall come into force from the 1st day of July, 2017. 1. (1) These rules may be called the Income –tax (17th Amendment) Rules, 2017. (2) They shall come into force from the 1st day of July, 2017. “(5) Every person who has been allotted permanent account number as on the 1st day of July, 2017 and who in accordance with the provisions of sub-section (2) of section 139AA is required to intimate his Aadhaar number, shall intimate his Aadhaar number to the Principal Director General of Income-tax (Systems) or Director- General of Income-tax (Systems) or the person authorised by the said authorities. 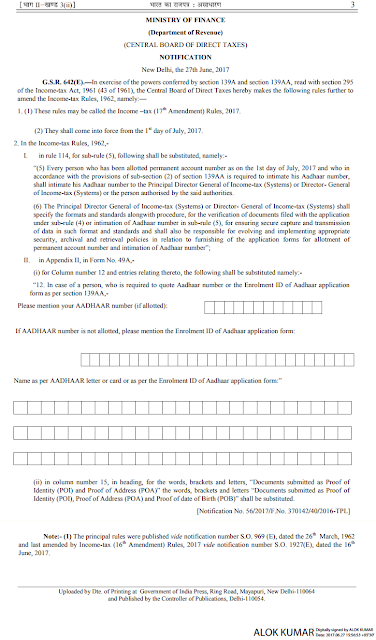 Note:- (1) The principal rules were published vide notification number S.O. 969 (E), dated the 26th March, 1962 and last amended by Income-tax (16th Amendment) Rules, 2017 vide notification number S.O. 1927(E), dated the 16th June, 2017. Income –tax (17th Amendment) Rules, 2017, come into force from the 1st day of July, 2017, The Central Board of Direct Taxes hereby makes the following rules further to amend the Income-tax Rules, 1962, now may be called the Income –tax (17th Amendment) Rules, 2017. and they shall come into force from the 1st day of July, 2017.